The highlight of our Christmas was a visit to the Barbican Theatre, London, on Saturday 21 December 2013, to see David Tennant performing in the role of Shakespeare’s Richard II. Richard II is one of English history’s villains. So who better to play him on stage and change our view of him than one of our contemporary heroes, the charismatic David Tennant? But Richard II is also one of those kings who is a mystery to many of us; what we do know may be gleaned from primary school history, or a visit to Westminster Abbey. There the main thing we learn about him is that he was murdered on the orders of his successor, Henry IV, and his body was initially buried somewhere else, but eventually Henry IV felt so guilty he moved the former king to the grand tomb he’d originally had built for himself in Westminster Abbey – which is where we may contemplate him today. Richard II: An Unbalanced King, we are told in the brilliant comic classic book 1066 And All That, was only a boy at his accession: one day, however, suspecting that he was now twenty-one, he asked his uncle, and, on learning that he was, mounted the throne himself and tried first being a Good King and then being a Bad King, without enjoying either very much. 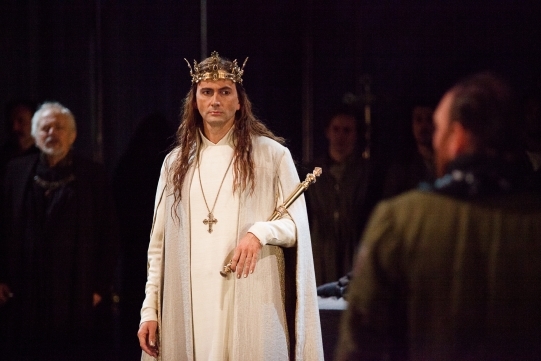 David Tennant’s Richard II showed us a petulant, whining, rather effete, figure in what my two teenagers could only describe as long hair and a long white nightie (and of course a crown on his head). We were there because my two teenagers love David Tennant for being Doctor Who. Yet how he opened up my view of this bad king. All the raw vulnerability of the character was there, and I ended up feeling much more about Richard than that he was simply a baddie basking in undeserved glory in a tomb in Westminster Abbey. Instead he was a real live fragile human being, with his moral weakness and disastrous decisions, different on the inside from the outside, as we all are. For example, take a walk round Westminster Abbey, as I did the other day – here, in this major spiritual hub and London tourist attraction you’ll pass the shrine of St Edward the Confessor, and find clustered around him many monuments and tombs. The official tourist guide says these speak both of human dignity and achievement. But do they? Among them we find both the goodies and the baddies. Some are noble but others got there by ruthlessly exploiting everyone and everything in their lust for power. Of course, after contemplating Richard II, who was so awful he was murdered by his successor, but still eventually ended up in the grand tomb he’d built for himself in the abbey, we can then move on to Poets Corner which shows us a much better aspect of human nature, celebrating creativity and genius to uplift and inspire us. But now Shakespeare and David Tennant between them have deepened my view of Richard – as all great creatives must do with the characters they portray. Now I know why David Tennant had his hair in a pigtail on Graham Norton’s Show this autumn! Yes we saw him on Graham Norton’s Show too & were particularly struck by the pony tail. What amuses me about his appearance as Richard II – long white robe and long hair – is that it reminds me of the illustrations in my childhood book of poems by AA Milne. I remember the illustration to the poem about bad King John – although he was 150 years earlier than Richard II, their style of dress didn’t change much!